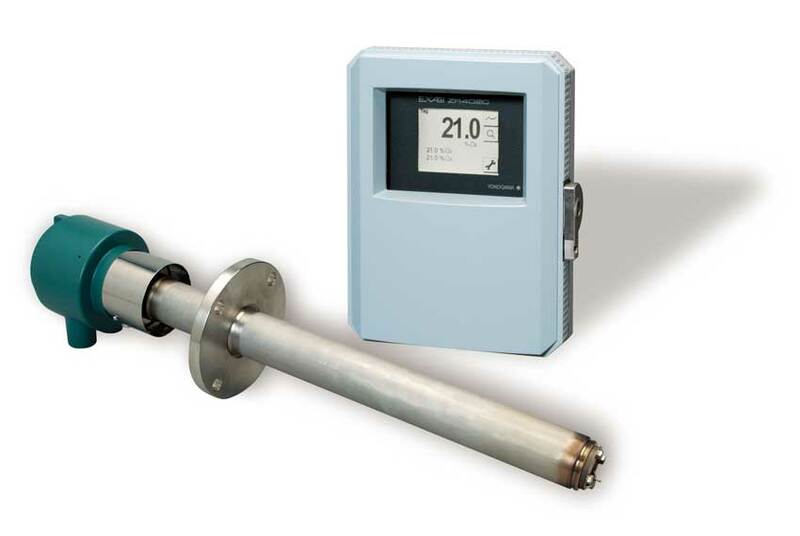 Yokogawa's zirconia oxygen analyzers are used for combustion monitoring and control in a wide variety of applications and help industries to make considerable achievements in energy saving. The applications range from energy-consuming industries, such as iron and steel, electric power, oil and petrochemical, ceramics, pulp and paper, food, and textiles, to various combustion facilities, such as incinerators and small- and medium sized boilers. Combustion monitoring and control using the analyzer also contribute to a lowering of CO2, SOx, and NOx emissions by allowing for more complete combustion, thus preventing global warming and air pollution. The ZR402G converter is equipped with an LCD touch screen which has various setting displays, a calibration display, oxygen concentration trend display, with easier operation and improvement of display functions. The converter is equipped with various standard functions such as measurement and calculation as well as maintenance functions including self-test. The ZR22G separate-type detector uses a high-reliability zirconia sensor, and its heater assembly can be replaced on site. The detector is mounted, for example, on the wall of a flue and can measure the gases directly. The ZR22S separate-type detector for explosion-proof applications is also available. The separate type converter ZR402G incorporates a LCD touchscreen for ease of operation. The built-in heater assembly of the probe can be replaced on site, reducing maintenance costs (ZR22G only). The probe uses a long-life, high-reliability, field replacable Zirconia sensor. Remote maintenance using digital communications (HART) reduces maintenance costs. Note: HART is a registered trademark of HART Communication Foundation. Heater and thermocouple replaceable construction. For 0.15m probe, -0.5 to +5 kPa. This portable calibration kit is designed for applications where there is no permanently mounted calibration solution and can be used with any ZR probe. It consists of two 103 L calibration gas bottles (1% O2, balance N2 for zero and 21% O2, balance N2 for span), two 0.5 L/min flow regulators, ten feet of tygon tubing, and one 1/4" NPT to 1/8" barb fitting, all contained in a hard carrying case with a shoulder strap. The MC1 can be used to calibrate the sensor and monitor reference air delivery for any ZR probe. The panel allows easy operator adjustment of calibration and reference gas flow rates, as well as manual switching between zero and span calibration gases. The panel requires standard clean, dry, instrument air for reference air and span calibration gas, and also requires zero calibration gas. This automatic calibration unit can be used to calibrate the sensor and monitor reference air delivery for any ZR probe attached to the ZR402G analyzer. Calibration is simplified by allowing the whole calibration procedure to be done from the analyzer's interface (or remotely) in semi-automatic mode, or by setting a timed automatic calibration in the ZR402G. The solenoid valves also have manual overrides for troubleshooting or performing a manual calibration if desired. The unit requires standard clean, dry, instrument air for reference air and span calibration gas, and also requires zero calibration gas. This automatic calibration unit is directly mounted to the ZR22G probe's reference and calibration ports. Calibration is simplified by allowing the whole calibration procedure to be done from the analyzer's interface (or remotely) in semi-automatic mode, or by setting a timed automatic calibration in the ZR402G. This unit does not have manual overrides and must be used in indoor applicaitons only. The unit requires standard clean, dry, instrument air for reference air and span calibration gas, and also requires zero calibration gas. The accumulation of fly-ash on the zirconia cell affects its ability to measure oxygen concentration. to keep particulate and ash off the measurement cell. This filter is used to protect the cell from corrosive dust components in natural gas or oil-fired applications. Two cables are needed to connect a ZR22 to an AV550G or ZR402G. One heater cable set is necessary to send power from the analyzer to the heater assembly on the probe, and one signal cable set is used to provide the analyzer with information about the probe's cell voltage, thermocouple reading, and remote junction temperature for compensation. We recommend running these cables in separate conduit to avoid heater wires having an affect on the signal wire readings. To detect air leaks, an oxygen analyzer is used. The ZR22/ZR402 Direct In-Situ Zirconia Oxygen Analyzer has been well received due to its good response speed, stability, and maintainability. Drying is an important part of the papermaking process that evaporates the remaining water in the wet paper web. This is performed with a dryer, and the humidity control in this dryer is essential to maintaining high paper quality (e.g., strength, paper surface) and high heat energy efficiency. There are various methods for continuous fabric dyeing as well as dye fixing. When dye is directly applied, steaming (heat treatment) is required. At present the pad-steam method is widely used for continuous dyeing. To ensure stable product quality, the humidity in the steamer is kept at a constant level. Humidity control is important to maintain product quality and improve yield. The ZR402G/HS Direct In Situ Zirconia High Temperature Humidity Analyzer is easy to maintain as it requires no sampling system. To technology in iron & steel industry is continuously improved to obtain the best possible performance. The improved plant performance gives rise to the higher quality improvement and lower cost, and simultaneously environmental friendly plant operation. A furnace for heating slabs needs to be operated under low oxygen conditions at high temperatures of 1000°C and above to prevent oxidation of the steel. The measurement of oxygen concentrations in the furnace is essential in this process. In a pulverized coal-fired boiler of a large power plant, an oxygen analyzer is essential for combustion control. A pulverized coal-fired boiler is an industrial or utility boiler that generates thermal energy by burning pulverized coal (also known as powdered coal or coal dust). In a hot blast stove, the by-product gas produced in a coke oven is burned to preheat the air blast for the blast furnace. To improve the combustion efficiency and conserve energy in a hot blast stove, it is essential to be able to control combustion by measuring and adjusting the oxygen concentration in the exhaust gases. A package boiler operates more efficiently if the oxygen concentration in the flue gas is reduced. Optimizing air intake for boiler operation requires continuous measurement of the oxygen concentration in the flue gas.